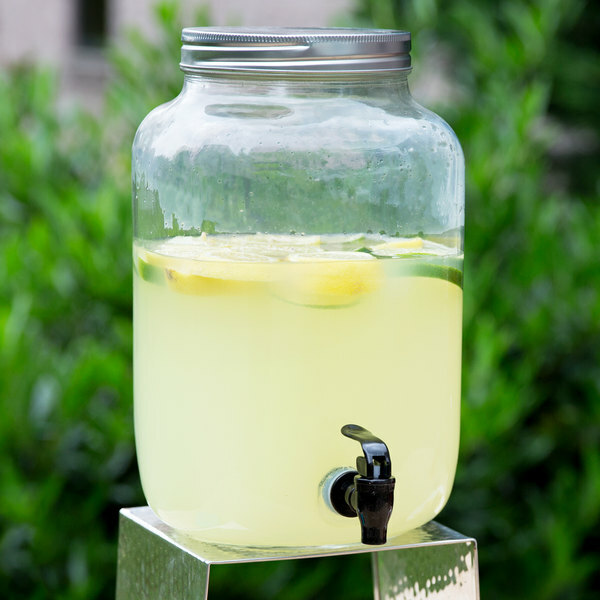 From fresh lemonade to refreshing water, create a stylish self-serve station with this Acopa 2 gallon mason jar glass beverage dispenser. This dispenser is a great addition to your restaurant, cafe, hotel, or catering beverage ware collection. It has a charming, vintage jar design that creates an eye-catching set up sure to complement your station's arrangement. The ample capacity ensures your guests have enough to drink on hand, while the crystal-clear construction expertly showcases your beverage for an attractive display. 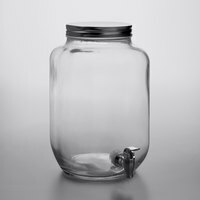 "The Acopa 2 Gallon Mason Jar Glass Beverage Dispenser is well made and heavy. The lid closes easily and tightly. This is great for catering events and any special occasion." Made with thick glass, this non-insulated dispenser is strong and made to give you long lasting use. The crystal-clear glass also provides a great display of your drink and its vibrant colors, making this a great unit to set out on buffet tables or at a self-serve station. This dispenser also includes a lid to keep any contaminants out, so you can serve the perfect drink both indoors and outdoors. The old-fashioned shape of this dispenser adds a nostalgic touch to your self-serve station while showcasing your delicious drink. An elegant silver spigot offers an easy way to effortlessly dispense your refreshing beverage, no matter where the dispenser is located. 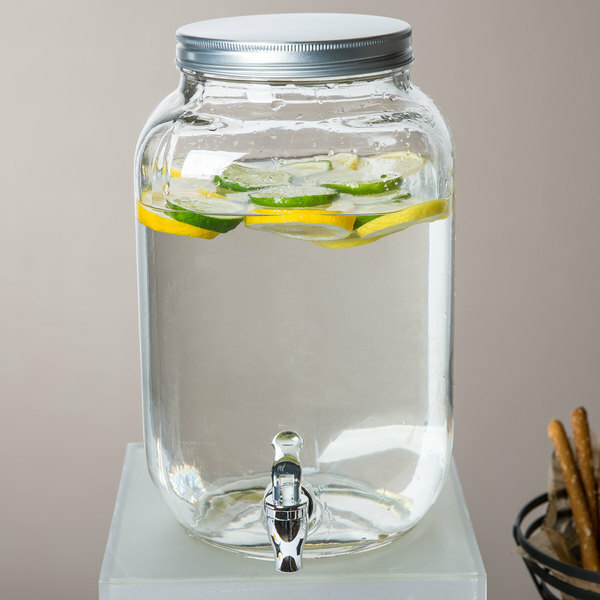 This mason jar beverage dispenser is a great product. It is priced extremely well and it looks pretty nice too. The lid does not screw on and someones comes off too easily. The plastic dispenser part is also no the best quality but for the price we will take it! If superior quality is not of utmost importance you will like this product. Purchased a couple of these for a very fair price (for use in our office for meetings and events.) In addition to the beverage dispensers, we purchased the compatible Acopa Black Beverage Dispenser Metal Stand and the Acopa Glass Beverage Dispenser Ice Core and Infuser Set. I can confirm that these items are all indeed compatible with each other. The beverage dispensers are great for the price, the metal lid is somewhat flimsy (could be bent or dinged easily) but fits securely to the rim of the dispenser and is easy to take off for refilling, etc. The dispenser comes without the spout installed, but it is very easy to securely screw it into place. Absolutely love this jar. Perfect for multiple uses. Party dispenser, drink storage, or making kombucha. Just as advertised. Couldn't be more happy with it. As advertised. I purchased two of these beverage dispensers. They are a hearty two gallons each, which I personally prefer so that I can make one extra large batch of punch without having to constantly attend to adding more to the dispenser. Decided to purchase 1 of these after the ones I got from another store started leaking after filling it up only half way! Happy with my purchase, definite recommend. The jug is excellent, the spigot is adequate, the lid is a piece of junk if you are using the jug for liquids. I bought 4 to dispense pure water, and after a single week the lids are rusting and worse leaving rust marks on the bottle threads. Rust and pure water ... not a good combination to display. I called to ask about a replacement lid and was told "this is a low cost item, under our own brand, and you can purchase another lid that is the same as the rusting one..." no they do not sell any alternative lids that don't rust, (plastic, glass, or food grade metal that wont rust). Great jugs, lousy top. Disappointing.. Thank you for your review, Richard! 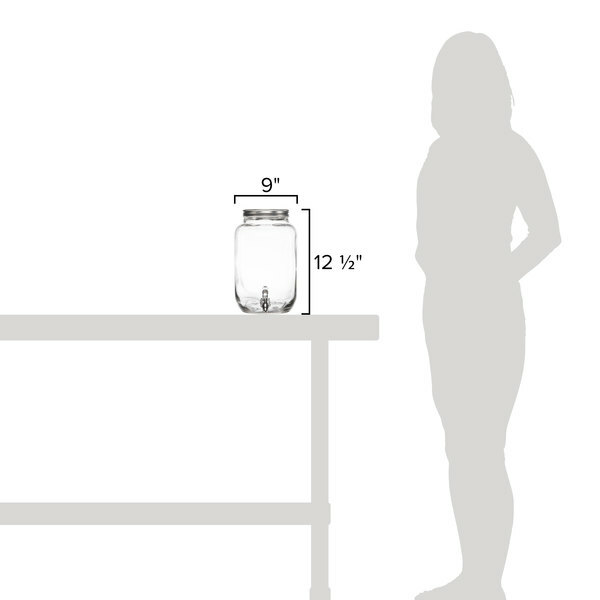 We are sorry this Acopa 2 Gallon Mason Jar Glass Beverage Dispenser has not worked well for you. We recommend drying metal immediately after washing to avoid rust. Please contact our Customer Solutions team if you have any questions. I absolutely love this beverage dispenser! 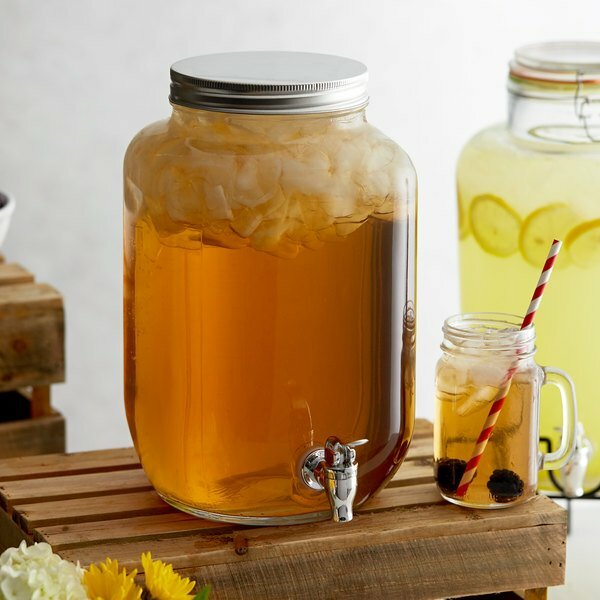 It's a great way to display fresh lemonade or ice tea right on the counter! It creates a beautiful and enticing visual for my customers. Pretty AND functional! Glass is just fine, totally gets the job done. However we had trouble with the Lids, and the spouts. Found both of these to be poor quality.... going to be ordering more this year, and looking for a better option. Thank you for your review, Matthew! 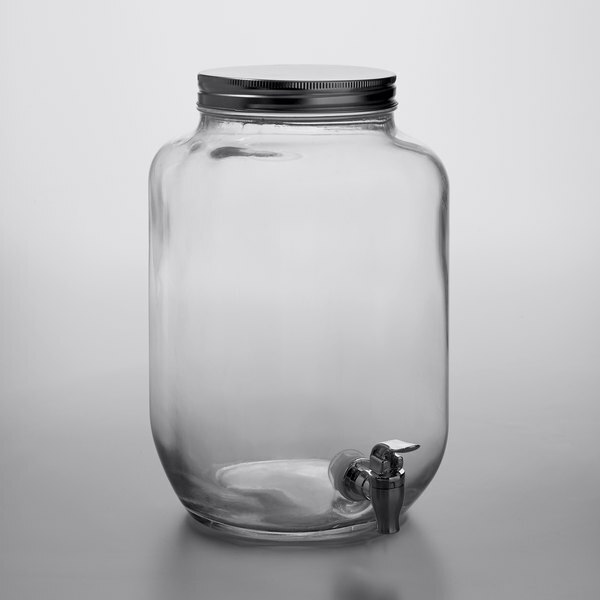 We are sorry this Acopa 2 Gallon Mason Jar Glass Beverage Dispenser has not worked well for you. A Customer Solutions Representative will contact you soon! 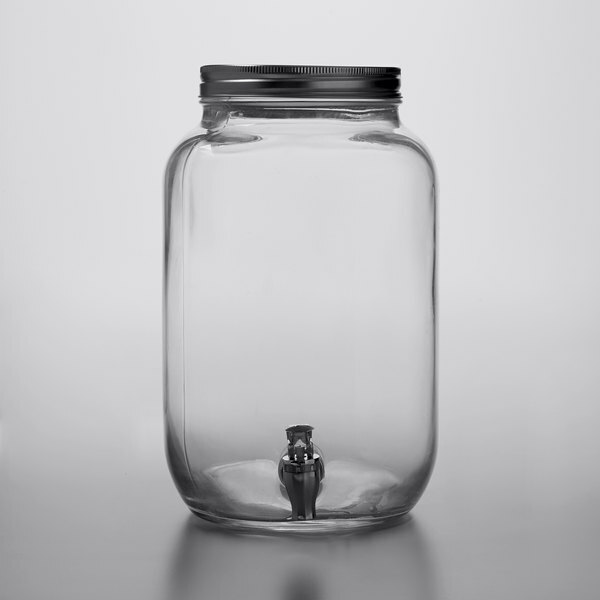 Very good jar for multiple applications. 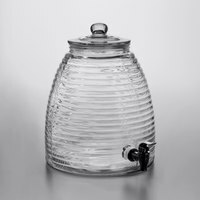 You can use it to serve water, to brew kombucha or even to store some kind of punch of cocktail for a party. The glass seems thick enough for it not to break easy and it closes tightly. 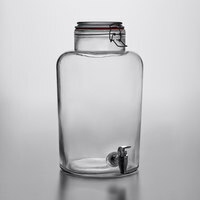 I purchased 4 Acopa 2 gallon glass beverage dispensers. I have used these at 5 weddings/events in the past 4 months. One broke when it was washed (someone put it in hot water while it was still ice cold) user error. Love them! It looks nice, but it is a fairly thin glass. You get what you pay for. Don't pour very hot liquids into it. We made hot tea directly in here that we were going to ice, and the glass cracked and two gallons of tea went all over the place. Don't let the price fool you. We thought that it wasn't going to hold up, but we were wrong. 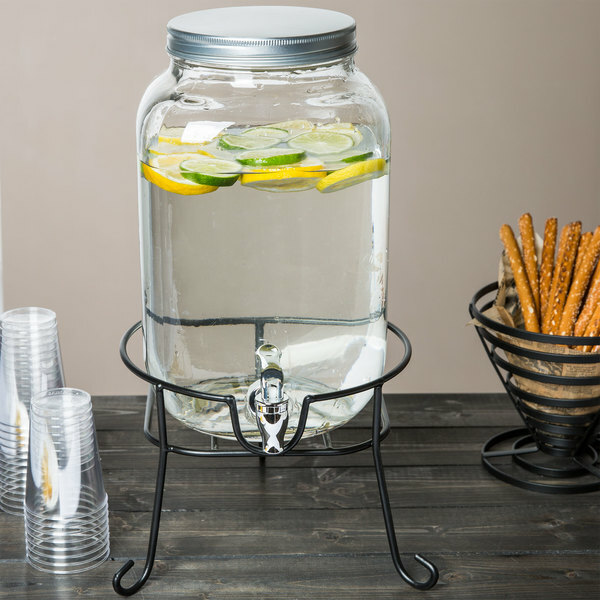 This is a perfect beverage dispenser for small and medium size events. Thank you so much! 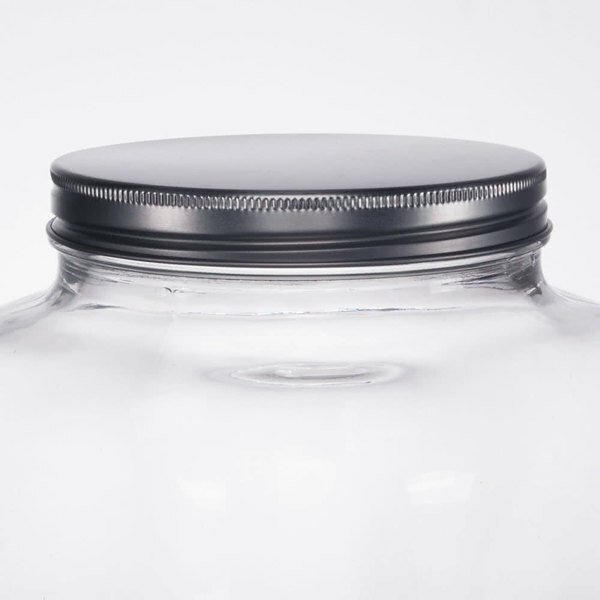 The Acopa 2 Gallon Mason Jar Glass Beverage Dispenser is well made and heavy. The lid closes easily and tightly. This is great for catering events and any special occasion. 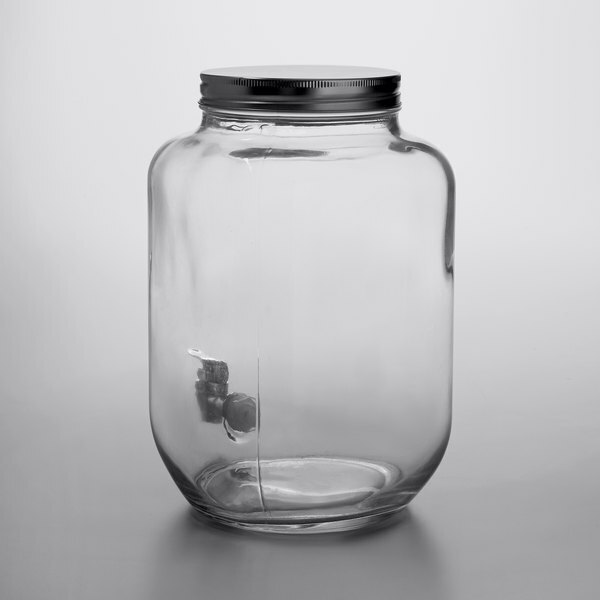 A nice smaller size mason jar glass dispenser that is perfect for small gathering. The mason jar look is great for picnics and BBQs. 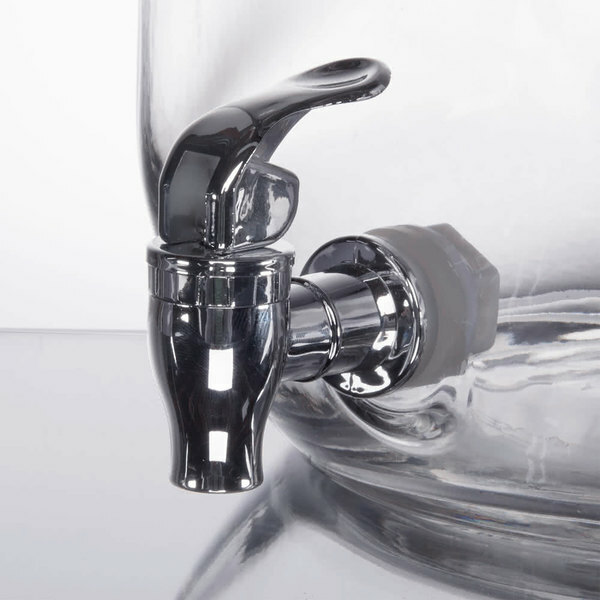 We love the strong glass and easy to dispense valve. These were perfect for our rustic themed wedding. I used 3 for water, unsweetened tea, and sweet tea. With lemon slices in all three they looked adorable. I ordered 4 of these to use for our wedding in June, they all arrived quickly and in perfect condition. They are going to be the perfect combo with the Acopa mason jar mugs that I also ordered. Can't wait to use them for our special day! This is a good unit. It is pretty lightweight and easy to pick up when full. It isn't super big though so I think we will wind up using two of them at a time for service.